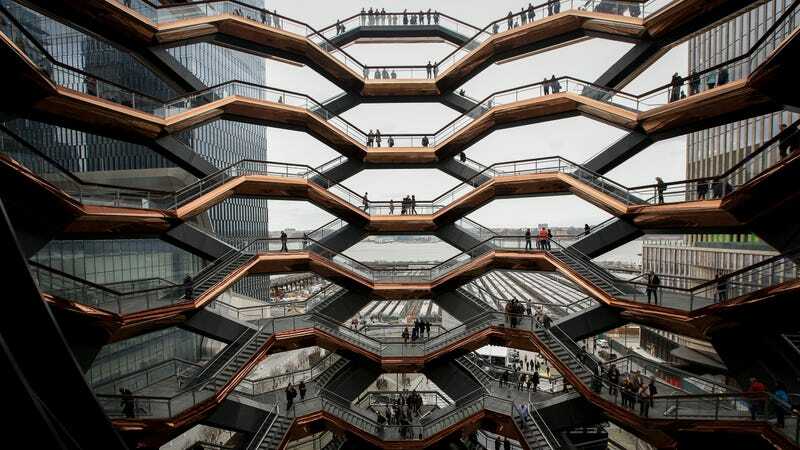 New York City’s newest luxury neighborhood, Hudson Yards, officially opened on Friday and visitors are already scrambling to photograph or mock its gilded pinecone landmark structure dubbed the Vessel. But, as Gothamist points out, Hudson Yards seemingly claims rights to all such photos of the $150-million giant honeycomb floating above an active train yard, so long as they’re taken in and around the Vessel. According to the terms and conditions, visitors agree to these clauses when they enter the Vessel. Mickey Osterreicher, general counsel for the National Press Photographers Association told Gothamist that these terms and conditions don’t mean that Hudson Yards owns visitors’ content, but the organization is allowed “broad license” to use the content how it would like without visitors’ consent. And it means visitors can’t use their Vessel content commercially, according to Osterreicher’s reading. James Grimmelmann, a law professor at Cornell Law School and Cornel Tech, blasted the “content” clause on Twitter. This suggests that Hudson Valley can use images that visitors post for Hudson Yard’s security protocol, and store the photos in a database. If you plan on visiting the new Hudson Yards, perhaps consider turning off your phone before you arrive. Correction March 21, 9:45 am EST: The original version of this article stated that the Vessel cost $200 million. The public structure cost $150 million, whereas the $200 million figure includes the surrounding public square and gardens, according to a spokesperson for Hudson Yards.